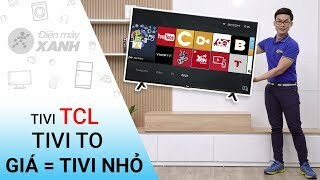 The 43-inch full hd smart tv 43s62 black TV is manufactured by TCL and was added around April 2018. This version of the TV comes in Color : Black , Screen Size : 43 Inch , Display Technology : LED , Special Features : Internet Connectivity , Special Features : Wifi , Special Features : Without 3D , Special Features : Smart TV , Refresh Rate : 960 HZ , Display Resolution : Full HD. The best price for the 43-Inch Full HD Smart TV in Dubai, UAE is AED 834 sold at LetsTango and available with free shipping and delivery within Next day delivery for most orders. By comparing prices and buying from the cheapest store you can save up to 7% or AED 65.